This coming Sunday we've got people being baptised in the 9am and 11am meetings in Bracknell. These are always amazing opportunities to hear how God has been changing lives - please be there if you can and why not invite someone to come with you to hear the stories. Leon Johnson is speaking at the Bracknell morning meetings, Lydia Harris-Lane is speaking in Sandhurst and Liam Parker at the Bracknell 6pm - it's going to be a great Sunday! Please be sure to make at least one of our gatherings! Let's be praying that a day would come when we have people being saved and added to the church every day, and that we start having to schedule baptisms more and more regularly because there are just so many people wanting to get baptised! Until then let's be very grateful to God for the amazing fruit we already see. Last week we also had out highest ever attendance for a 'regular' Sunday in Sandhurst with over 150 people coming along. 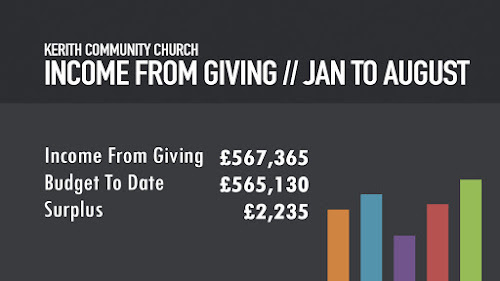 Numbers alone are never that big a thing for me, but it is exciting to see our Sandhurst site growing and flourishing under the excellent leadership of Ben and Heather. Ps - if you're a leader or aspire to lead in Kerith please come along to our all leaders meeting next Tuesday - starting at 7.45pm in K2 in our Bracknell site. 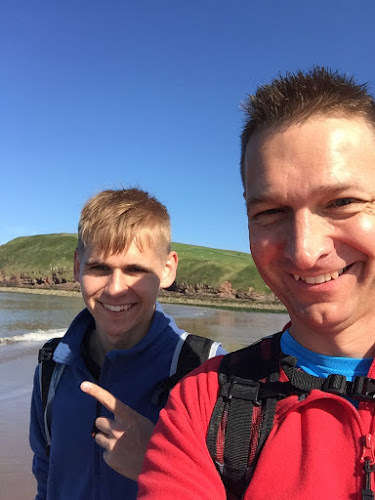 Right at the start of my sabbatical I did the Coast to Coast walk with our younger son Jacob. This is an unofficial 190 mile wak from St Bees in the Lake District to Robin Hood's Bay in Yorkshire, pioneered by Alfred Wainwright who is famous for his series of walking books. It takes in some absolutely spectacular scenery and some of my favourite bits of England. We did 11 days of walking with a rest day in the middle, averaging about 18 miles a day. We stayed in a whole range of Bed and Breakfast places, and has a brilliant time together. Here is us at the very start just about to say goodbye to the Irish Sea! I've written before that two of the key elements of taking time to be with God are to stop and to delight. This walk was brilliant for both of those. First of all to stop. Stopping is a statement of trust in God, that even if I pause from working God will continue to look after the things which are important to me. Those things could be your education, your company, your family or your home. We live in a world that is now so connected that it can be very hard to stop. We can be on the other side of the world and still getting work emails and texts stopping us from stopping! For me the walk forced me to stop. I'd already made the decision to turn off my Kerith email for the duration of my sabbatical, but even then I know it can take me a long time to mentally disengage from work. There's something about being on the top of a mountain, in cloud which is reducing visibility to about 50 metres, trying to work out how to get down again with responsibility for one of the people you love most in the world which stops your mind wandering to other things! We all need to find ways to create stops in our days, our weeks, our year and our years. To have a point in the day where work is over (whether work is answering emails, ironing clothes or doing homework) and relax and enjoy life. To have a day in the week when we stop doing whatever represents work for us. To have times in the year where we stop for holidays, retreats and family time and cease working. And even times in the years when we can reflect on life, where it is going and reconnect with God. But what to do when we stop? Well that's where delight comes in! God created a world, and people in it, that we are supposed to enjoy and find great pleasure in. It's scares me when I ask Christians what they enjoy doing and they can't even remember the last time they did something just because it was fun. It may feel very pious to fill life doing things that don't actually bring you joy, but it's actually a denial of who God created us to be. For me I most come alive when I'm outdoors, and by that I mean big outdoors, not just in the back garden. Mountains, valleys, seas and lakes, sunsets, long walks and wild weather are things that make me feel most alive. So for me the Coast to Coast walk was a huge delight, not just being in that environment but sharing it (often in silence!) with Jacob and the many others we got to know along the way. 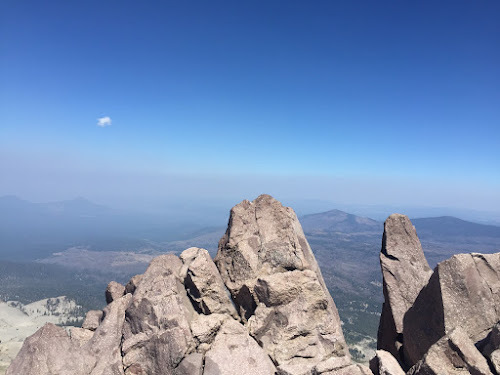 On another bit of my sabbatical I climbed Mount Lassen, a volcano in Northern California which last exploded in the early 1900's - I felt very alive there too! I don't know what you delight in? Going to the cinema, baking, rebuilding cars, painting with watercolours, reading, singing, dancing, seeing Japan beat South Africa at rugby or writing down train numbers? What I do know is that part of God's plan for our lives is for us to find joy in this life, not only joy in Him but joy in all He has given us. So as you stop don't just stop and slouch in front of the TV. Stop and delight - it will do you so much good! We currently have a part time, short term vacancy within Konnections, our ministry at Kerith that supports children with disabilities and additional needs and their families through a number of respite projects and schemes. We are looking for somebody with strong administration skills as well as good people skills to provide day to day support to our Konnections Manager. The position is 16 hours a week and is initially on a 6 month contract. Application packs with a complete job description are available at The Kerith Centre Reception. The deadline for applications is Monday 12th October. It was so good to be back on Sunday. Apologies to all those I saw in the distance but didn't actually get to say hello to - hopefully I'll catch all of you over the next few weeks. On Tuesday 29th September we've got our next All Leaders Meeting, starting at 7.45pm in the K2 building on our Bracknell site. It's open to anyone who either already leads or would aspire to lead anywhere in the life of Kerith. If that's you please consider yourself invited, even if you've never come to one before. As well as our usual cheese and wine and an opportunity to catch up with one another, I'm going to spend most of the evening reflecting on the results of the church survey we did before the Summer. Much of what is in there ties in with thoughts I had on my sabbatical which was really interesting. Come along to hear about that, and what we have planned for the rest of this year and early 2016. I'm so looking forward to being back with my church family on Sunday. Although I've really enjoyed and benefitted from my sabbatical, being away from both my immediate family and my Kerith family has undoubtedly been the biggest hardship of it all. On Sunday I will talk a bit about my sabbatical and some of what I've learned, but want to do that in the context of pointing us to Jesus and how I've grown closer to him in my time away. We'll also all be learning a great new song from Bethel which will express much of what I want to say in worship. As well as all that we'll also be announcing the current total for the offering to help alleviate the refugee crisis - very exciting. If you still want to give then you can find all the details here, or just put your gift in one of the giving envelopes on Sunday, mark it for the refugee crisis and put it in the regular offering. Can't wait to catch up with as many of you as possible on Sunday. If you're away for the weekend I hope you have a fabulous time wherever you are, and find time in all you're doing to connect with him. Well my 12 week sabbatical is over and I can honestly say it was one of the best experiences of my (as of Monday) 50 year life. The biggest impact has been in my relationship with God, which has been transformed by having the space to be with him in so many different settings. I pray that you'll all experience the fruit of that in the coming weeks, months and years. I also feel I've got a much clearer sense of what God has for us as a community, and the part that I can play in making that happen. My sabbatical was rich in all of those things - things which I hope I can help all of us find as we seek to build an emotionally healthy community. Lots of people have asked what I actually did for the 12 weeks, so I thought in a handful of blogs over the next few weeks I'd talk about some of the things I got up to and the impact they had on me. Hopefully we can all learn from those. All that said it's great to be back. I was in the office yesterday and it was so good to reconnect with so many friends. If there was one downside to being on sabbatical it was being away from my own family for quite a bit of the time, and from my wider church family for pretty much all of it. Church is family, and I can't wait for Sunday to be able to reconnect with everyone again. Following the tragic scenes of hundreds of thousands of refugees attempting to flee to Europe from Syria, Iraq, Afghanistan, and many other countries, many of us have been asking what we can do to help make a difference. 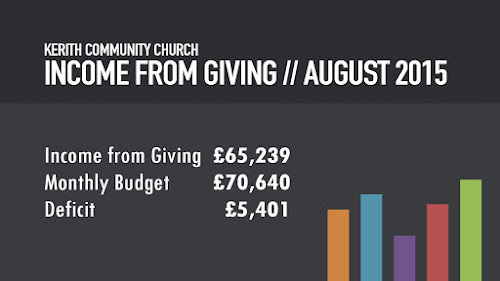 50% will go to our partners at Tearfund – they’ve launched a new Emergency Fund to bring desperately needed help and support. For some time already, Tearfund has been working with partners in many of the affected nations from where the refugees are coming. Now they are partnering with church groups in Europe, enabling them to offer care, support and aid to those that have already fled and are in huge need. “Currently we have different teams that are at the central station of Munich to welcome refugees and to help them get to their registration or to connecting trains or emergency camps. They’re also distributing food & drinks. We have also lots of teams in the arrival centres and refugees camps throughout the city and are working on a long-term relationship with refugees. As the camps are overcrowded the basic needs are clothes, food, medicine and doctors. On Sundays we are welcoming more and more refugees in our celebrations and many are touched by Jesus. It’s great how Jesus opens their hearts. Secondly, our friends at Home for Good are asking churches across the UK: could your family think about becoming Foster Carers to help the increased number of unaccompanied minors – children fleeing from crisis that don’t have family with them – that need a loving and supporting ongoing family? Home for Good work with many local authorities across the UK and are compiling a database of people who have space in their homes and may be interested in exploring further the possibility of fostering unaccompanied asylum-seeking children for a few days in an emergency, short term or long term. They have up-to-date information on their website available here. Thirdly, we can all pray – God can change governments and can change circumstances. Let’s call his power to intervene in this circumstance. Not just in Europe, but in the countries from where these people have been displaced. If you’d like ideas of how to pray, look at the 24-7 prayer website & blog. We'll be praying on Sunday, too.